Depending on your vantage point, the economy may or may not be on its way to recovery. Although there are some encouraging signs statistically, I still sense a lot of caution in the air. Even if you're gainfully employed at the moment, I don't think anyone feels particularly secure and upbeat in the near term, and this leads to each of us being cautious with our financial decisions. In the wine trade we continue to see retailers offering wines at low prices unheard of just two years ago. In Massachusetts in particular last year's 6.25% tax increase on alcohol continues to encourage consumers to buy wine in nearby tax-free New Hampshire. And the Massachusetts ABCC prohibits retailers from selling wine to out of state customers. So what do you do if you're a young Massachusetts couple with good jobs and two young children? 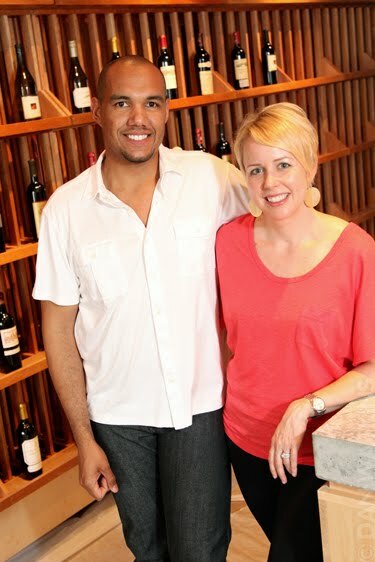 If you're Hadley and TJ Douglas you open a wine store! The Urban Grape recently opened in the newly-redeveloped Chestnut Hill shopping center. They acquired their license from the Fine Wine Cellars of Chestnut Hill that closed a couple years ago while the center was under construction. A new Star Market that doesn't sell alcohol anchors the shopping center (check here for a list of grocery stores in MA that do sell alcohol) as well as a Comella's Italian restaurant, a Rosie's Bakery, and an Aquataine French restaurant. Verizon and AT&T are also present allowing you to comparison shop while you're visiting the wine shop. Overall, it's a nice spiff-up of a shopping center that was getting a little run-down and The Urban Grape is a polished addition. Upon entering the store, the first thing I noticed was how sleek and minimalist the feel of the store was. 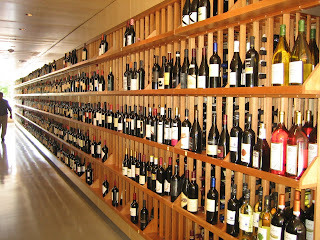 Everything in the store has a purpose and although they sell premium beer and spirits, the focus is clearly on wine. Off to the right are two Enomatic machines- one for reds and one for whites. 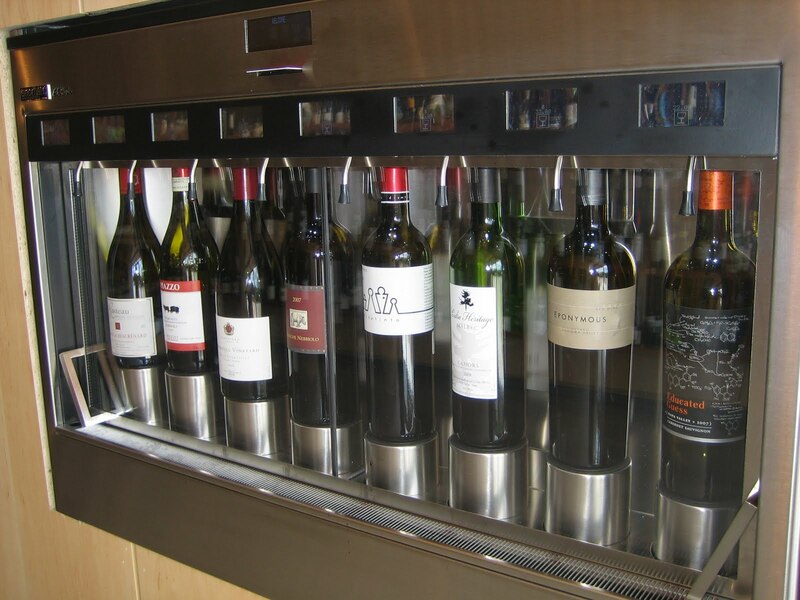 These machines allow you try a rotating assortment of their featured wines before you commit to buying them. I've seen these around in several stores and their effectiveness varies I think. Not because of the machine itself but because most customers aren't so brazen as to grab a glass themselves and start pouring themselves tastes. I bet they'll do well at The Urban Grape however because the store is so focused on customer service and hand-selling their products. The store carries roughly 800 different wines which is quite a bit fewer than large old-guard Massachusetts package stores and quite a bit more than you'll see at Costco. The single-most unique thing about the store is how they arrange these wines. Most stores arrange wine by region: France, Italy, California, etc. At The Urban Grape, the wines are broken up into whites, rosés, and reds then within each of these categories they're sorted by weight: 1-10. The arrangement concept is somewhat similar to what you'll see at Best Cellars and Wine Styles. In talking with owner TJ Douglas, the idea aligns with Kevin Zraly's philosophy from his Windows on the World book which is to pair wines with foods of similar weight. This is great for when we have a specific dish in mind. But when we're looking simply for all of the Barbarescos they carry it takes a little more work. But no fear- the store is well-staffed with knowledgeable and helpful folks, many of whom have graduated from the Elizabeth Bishop programs at Boston Univeristy. 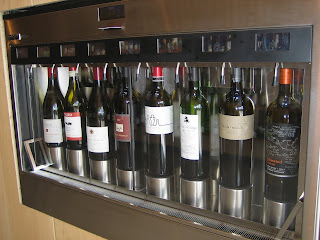 In addition to the wines on the wall, they've got higher end stuff in a 160-bottle EuroCave at the back of the shop. 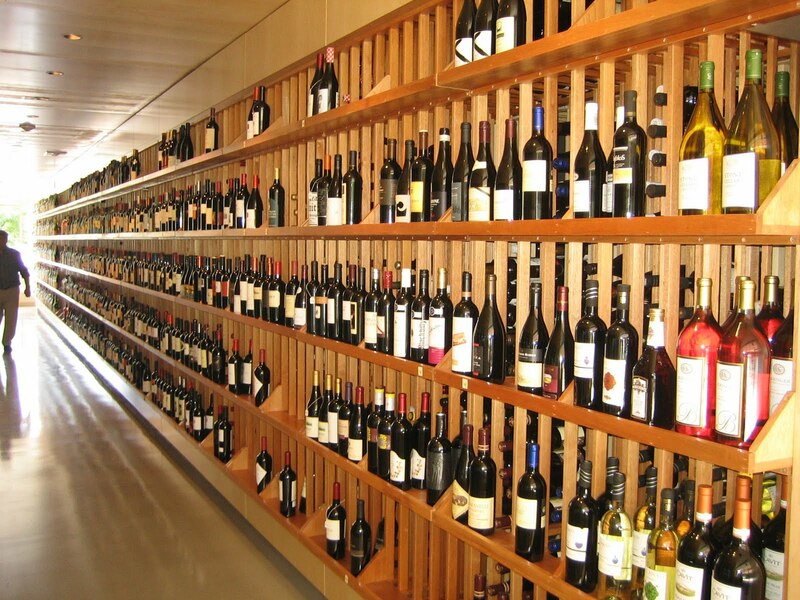 Here you can pick up your $100+ a bottle wines for special occasions. Overall I think the store does a great job of hitting wines at all price points- they're not afraid to carry Cavit Pinot Grigio magnums. They're next to a grocery store and I think it's a smart play to lure people in with familiar brands as they encourage exploration into other regions. TJ's passion for wine is immediately apparent, as is his expertise in speaking with people on the subject. He honed his skills working at the Massachusetts distributor Ruby Wines where he sold wines and educated restaurant waitstaff about how to present their wines. Although he's got his favorite categories, Italian Nebbiolo I understand, he doesn't want the shop to become a showplace for his preferences. This is something I asked him about- does he want the store to have a wine category it becomes known for? "No" he answered. I have a sense his background gives him an appropriate feeling for serving a customer the way they want to be served rather than forcing his preferences on his would-be customers. "The Urban Grape is a store for wine lovers, no matter where they may be on their personal journey. We truly believe that our store will build a community of wine enthusiasts who will inform each other, support each other and inspire each other to engage in wine in a way that is accessible and inclusive. So leave the attitude at the door and join us for a taste!" I think we'll see more Urban Grape locations opening up once the concept has proven to be effective. The branding is very well done and I can see it playing well especially in locations even more urban than Chestnut Hill. Ah yes, pricing. Chestnut Hill has a reputation for being ritzy in my book, and the store looks too nice to be considered a discount joint. Does the pricing at The Urban Grape follow suit? First off, the quantity discount policy at The Urban Grape is 15% off a mixed case. I took note of the pricing of a few wines I think value hunters typically benchmark. Some seemed a little high, yet others seemed quite favorable. $18 for a bottle of Kim Crawford Sauvignon Blanc seemed high. $9 for a Pine Ridge Chenin Blanc/Viognier seemed low. $50 for a Faust Cab. $48 for a Groth Cab. $44 for an 07 Ridge Lytton Springs. $27 for a Segeshio Zin you see below $20 at warehouse clubs. Depends on what you're looking for. Tuesday Tweets are one way they're looking to push the values. Follow them on Twitter to get wind of their 20% off deals. I'd love to see them (and any retailer for that matter) leveraging their E-mail list to push out deals to get people in the store and buy more while they're there picking up their orders. They've got an impressive array of communications channels they're leveraging already so I'm sure we'll see E-mail blasts as part of their strategy. I mentioned it last week in this piece about The Capital Grille but it's worth repeating: All of the wines being poured as part of the restaurant's Master Wine Tasting Series are available for purchase at The Urban Grape at favorable pricing. They've even got a blog they're updating regularly including this entry on a recent visit to The Capital Grille. 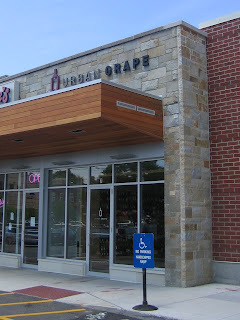 The Urban Grape is an upscale, suburban wine shop that's positioned itself intelligently-close to affluent consumers. Will I buy a lot of wine there? It depends on how they leverage their communications channels I think. I remember being equally impressed with nearby Winestone when I visited there last year yet I haven't made it back for whatever reason. Retailers that hook me in with regular E-mail offers and communication seem to set the agenda for weekend pick-up visits. The one question I couldn't get an answer to? "How much does it cost to open a wine store?" I could make some guesses but I'm sure it's like asking how much it costs to build a house: It depends. I wish TJ and Hadley all the best. So many people dream of opening a business and never do. Their entrepreneurial spirit is motivating to see and The Urban Grape is a welcome addition to a growing list of exceptional fine wine shops in the Boston area. What do you think of The Urban Grape?